Hot-Dogs is one of the best street foods all over the world! Shall we take it to another level? 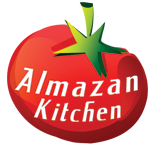 AlmazanKitchen’s level! Sure we do! Tortilla style Hot Dogs, under awesome hot milky sauce, balsamico and really fresh grated veggies mix! Believe me, it is the most satiasfying Hot Dog ever! Mix 1 hand of flour along with 1/2 hand of water and 1 tsp. of salt & sugar. Form a ball, cover with something and leave to rest. Take out the dough ball, attenuate and divide into half. Attenuate and flatten out each dough part, bake on coals until ready. Slice & dice 1 tomato. Chop handful of green onions. Grate 2 radish heads and cucumber. Mix 1 cup of yougrt with 1 tsbp. of chili flakes and 1 tbsp. of olive oil. We recommend to mix well for taste. Grill 2 white sausages for 3-5 minutes on coals. Do not forget to flip. Place everything on the tortilla (sausage and veggies mix), coat sausage in sauce and balsamico well!